ST. GEORGE — Officers were called to a convenience store Tuesday by employees who became suspicious when a man fell asleep in his pickup with the engine running and the woman he was traveling with disappeared into the restroom for more than an hour. Police arrested the man, Joel Armenta-Medina, 24, of Las Vegas, on five third-degree felony charges: one count of possession of another’s identity documents; one count of unlawful acquisition/transfer of financial card; one count of possession of a forgery/writing device; and two counts of possession of a controlled substance, according to the affidavit filed with the court Wednesday. He also faces three class B misdemeanor charges: one count of possession of paraphernalia, one count of driving under the influence of alcohol/drugs and one count of theft by receiving stolen property. Police also arrested Armenta-Medina’s partner, Ashley K. Wilms, 28, of Las Vegas on three misdemeanor charges, including one class A misdemeanor charge of drug possession, one count of possession of paraphernalia and one count of theft, both class B misdemeanors. Officers found Armenta-Medina “slumped forward and passed out” in the driver’s seat of the pickup truck that was still running, the probable cause statement said. On his lap they found a piece of tinfoil partially covered in brown residue that appeared to be heroin. During the arrest, Armenta-Medina reportedly passed out several times. In fact, “field sobriety tests were not given due to Joel’s inability to stand without nodding off and falling asleep,” police say in court records. 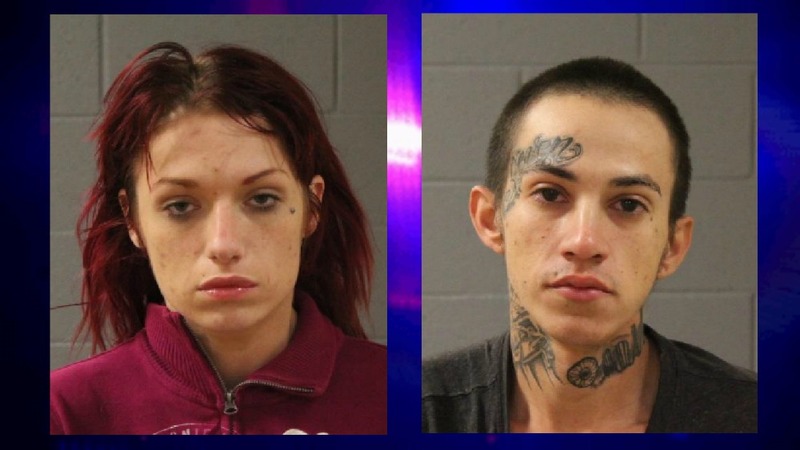 During a search of the vehicle, officers found drug paraphernalia, including used syringes, butane torches, glass pipes and plastic bags that contained drug residue consistent with methamphetamine and heroin, as well as a counterfeit $100 bill. Officers also found multiple Visa debit cards that did not belong to Armenta-Medina, along with a Consular I.D. card out of Mexico in someone else’s name. He had no explanation for having the cards, other than to tell the officers he had found them, the record says. Armenta-Medina was then transported to jail and during a records check officers found several prior felony convictions for drug distribution out of Nevada, which enhanced the charges filed in Utah. Wilms was also questioned by police who say she admitted to stealing $180 worth of merchandise from Maverik, including the two solar phone chargers that officers found inside the truck. Court records indicate that during a search of Wilms’ purse, officers found three needles containing what appeared to be methamphetamine, which the suspect admitted to using the day before. She was transported to Purgatory Correctional Facility. Both Wilms and Armenta-Medina are schedule to appear in 5th District Court in St. George on Thursday at 1:30 p.m. Bail has been set at $27,780 for Armenta-Medina, while Wilms is being held on $3,310 bail. Both suspects remain in custody as this report publishes. This report is based on documents filed with the court and may not contain the full scope of findings. Persons arrested or charged are presumed innocent until found guilty in a court of law or as otherwise decided by a trier-of-fact. This was a good bust! I hope these kids can get off drugs and turn their lives around. Getting a neck and face tattoo is never a great move! With a face tattoo like that who’d a thunk it? These two may just have their lives saved by being locked in prison. Then again, they might bail out quick and be back livin’ the fast life– meth, heroin, coke, crack, etc etc. Anything for that next high, right? Seems like such a waste.. I don’t know much about using drugs, because I’ve never used them, so I am wondering why drug users like to use convenience stores to shoot up their drugs and get their fix? Wouldn’t it be less risky getting caught to just wait until you get home to do drugs? Or are they just so desperate to use them that they can’t wait? I always think that people who say they have never done drugs are lying. Sorry about that. Its me not you lol. But have you never taken a hit of marijuana when you were younger? Have you never taken a prescribed pain pill? You and I can both say with truth that we have never shot up heroin or meth. I have done drugs, but I have never put a needle in my arm. I have never done heroin nor have I been near it. I did find that the second to last sentence in your comment brought me to a place of huh, Redbud, has a good point. But then you’re probably dead on on your last sentence. Plus, they probably are couch surfers and dont have a home of their own. Just curious, did you ever smoke crack or meth? What was the worst drug to be using would you say? I think heroin is a worse addiction than meth but I stayed away from it. I know a person that used meth to get off heroin. I didnt steal to buy meth. Meth doesnt make people steal. People were thieves before they started meth. Meth enhances their stealing. Stealing is a matter of the heart, not a matter of meth. I tried crack once, I tried coke once. Marijuana made me clean the house while making dinner and snacks. The worse? Meth. The devil’s middle name-Meth. Definitely opened up a spiritual warfare. But the best high of all is Jesus! Your question was did I ever smoke meth? Yes. And snorted it and swallowed it and put it in coffee. Crack. Yes. Heres how I stopped. True story. I heard God say, If you do drugs one more time you are going to jail. Never touched a drug again. I wont even let a doctor prescribe me pain pills either. One day they will be needed but not today, sir. I do not want to go to jail! Period! The End! Thanks Bob! It’s been a long time ago but you can imagine how I could be dead right now! But here I am. Livin’ the dream! Ladybug, no I have never shot up or smoked anything my entire life because I was raised in a strict LDS family. I have been prescribed opiods for surgery, but I have never taken them more than 2 weeks at a time. All of them were prescribed by a doctor. I will admit the opiods did a good job helping with the pain, but I wasn’t desperate to get my hands on more pills when I finished taking them. I guess they affect (or is it effect?) people in different ways. I have never craved a drug, so I can’t say I know what other people are going though. That said, I still don’t understand why people just don’t wait till they get home to do the drug, rather than risk getting caught in a convenience store, park, or other public space. Ladybug I will also admit to drinking alcohol, I still drink, but it’s only occasionally and I have never been an alcoholic. It’s not something I have to have. I understand. And I’m glad you never did drugs recreationally. I look back and I’m glad I saw a whole different world and had that experience and was then was saved from it. What a testimony I have to share to others struggling in that dark world. Not so sure about the death penalty, but yes most junkies care about one thing, and one thing only, how to get their next fix. With OD’s hitting record levels, it seems they are walking into their own DP with eyes wide open. I imagine this crew will get out and go back to playing Russian roulette. Guess these are the type of people who OD on fentanyl heroin. OD’s are up 70% this year with that. So many levels of stupid here. Seems Las Vegas is burgeoning with lots of crazy stuff. (Las Vegas Metropolitan Police have a Youtube channel and professionally detail their issues and OIS) Used to be Vegas people would just fill the mountain towns with visitors… getting a whole new generation of travelers now. The face and neck tattoos just scream “I’M A PERSON THAT MAKES BAD DECISIONS IN LIFE!”. I don’t understand why anyone would do that. Psychological trauma from a bad childhood or something? Just why? Hole in their heart and they think that this will fill it. So they do it and then the hole is still there and they cant take it back. Only Jesus can fill the hole in peoples hearts. even tho they are lowlife crack/meth heads I do feel sorry for them, esp the young ones like this. If the face tattoo wasn’t a result of a traumatic childhood maybe it was the result of excessive hard drug use. I know a lot of addicts tend to have severe mental health issues besides the drugs, so it could be that. It’s a sad thing.